April 2016 - Connecting with Donors Through Compelling Content with Michael Shepherd. PLUS, a morning workshop on Effective Evaluation with Jenna LeComte-Hinely of HARC, Inc.
On October 16, 2015 Chapter President Eileen Packer and board member Liz Nabie welcomed 48 luncheon guests for roundtable discussions with "experts" during AFP's annual Ethics workshop, PRACTICAL SOLUTIONS FOR COMMON ETHICAL DILEMMAS. 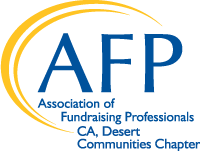 Earlier the same morning, 25 registrants paid rapt attention to a webinar presentation, MAKING EACH RUNG COUNT: HOW TO BUILD A DONOR LADDER THAT GOES FROM ANNUAL GIFT TO ULTIMATE GIFT, organized by Sarah Clapp, the chapter's VP of Programs. On September 17, 2015 Liz Nabie expertly led a morning workshop entitled THE LETTER OF INQUIRY: THE FIRST STEP IN GRANT WRITING with 35 participating registrants. Attendance swelled to more than 70 guests for the luncheon program, MEET THE FUNDERS, which featured Jonathan Weedman of Wells Fargo Foundation, Celia Cudiamat of The Community Foundation, and Lisa Fujimoto of Change A Life Foundation. Consultants John Kelleher, CFRE and Andrea Spirtos, CFRE presented THE ABC'S OF BOARD DEVELOPMENT to 40 morning workshop registrants. Afterwards at lunch, Ellen Goodman, Executive Director of Palm Springs Unified School District Foundation, spoke on MOTIVATION, RETENTION AND ATTRACTION OF BOARD MEMBERS. Based on her personal experience as a nonprofit board member, executive director, and legal counsel to nonprofit organizations, guest speaker Eve Fromberg-Edelstein answered questions from luncheon participants on May 15, 2015 on the topic, BEST GOVERNANCE PRACTICES OF HIGHLY FUNCTIONING NONPROFIT BOARDS. On April 17, 2015, Charles P. Howland, Senior Consultant & Principal, Marts & Lundy, led the morning workshop, TAKING THE MYSTERY OUT OF CAPITAL CAMPAIGNS. He was followed by a lunchtime panel discussion of CAPITAL CAMPAIGN CASE STUDIES featuring Jeffrey Dvorak, Sue Knollenberg, CFRE, and Peter Sturgeon.